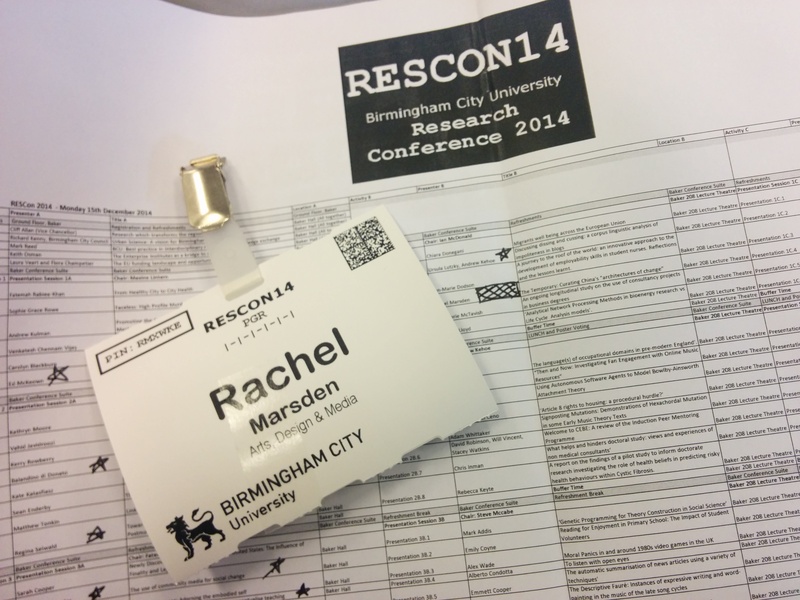 This week began with ‘RESCON14’ – Birmingham City University’s (BCU) annual Research Conference 2014. In the five years of my research, I have attended this only once for various, no doubt out of the country in China, reasons, so thought as the opportunity was there, it would be good to present my work. 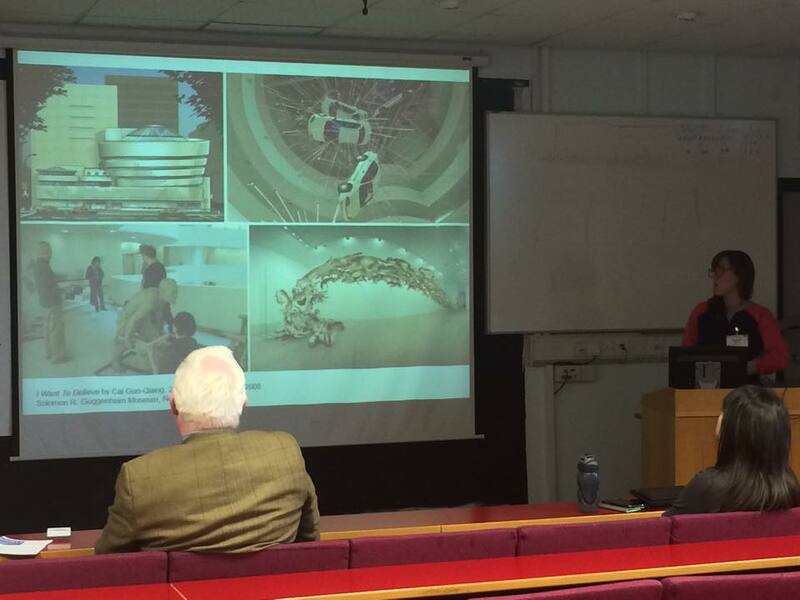 It was a day of triple scheduled, back-to-back, short ten-minute presentations about current research from BCU, where I presented the practical outcome of my current PhD research – ‘The Temporary: Curating China’s “Architecture of Change”‘ (I’ll speak about this later on). 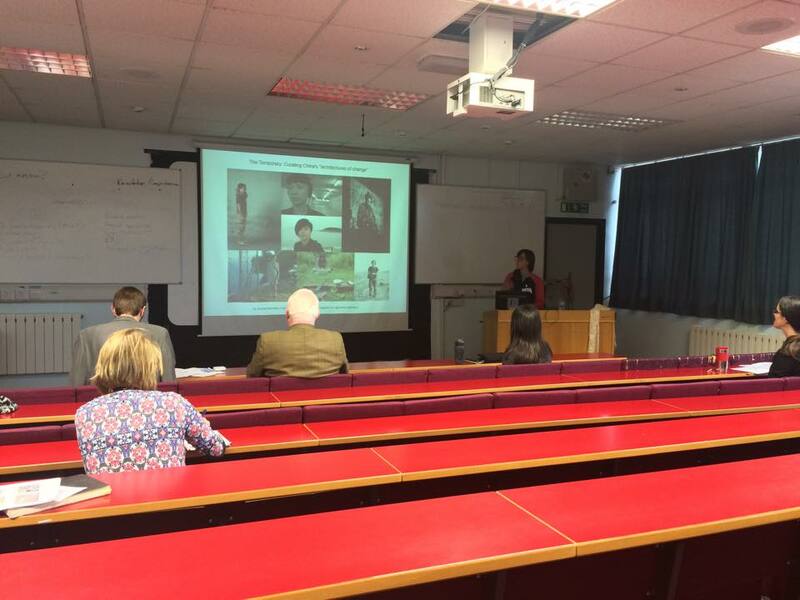 It was a great opportunity to find out the now of “contributions to new knowledge” across all faculties, departments and disciplines…also, a chance to show support for fellow PhD colleagues, who are at very different stages of their research. So good to see Karen, Anastasia, Ed and many more speak. Here are notes on the sessions that resonated with me-my research interests-my wordgirl-worldgirl daily habits…where some made my research brain very, very happy. New York creating an estimated $100 billion market in smart cities through applied urban science. Future is Cities: But do we need more than one to make a country? Spreading jam too thinly doesn’t work – concentrate on places that have biggest potential – Capital and labour flows to London? 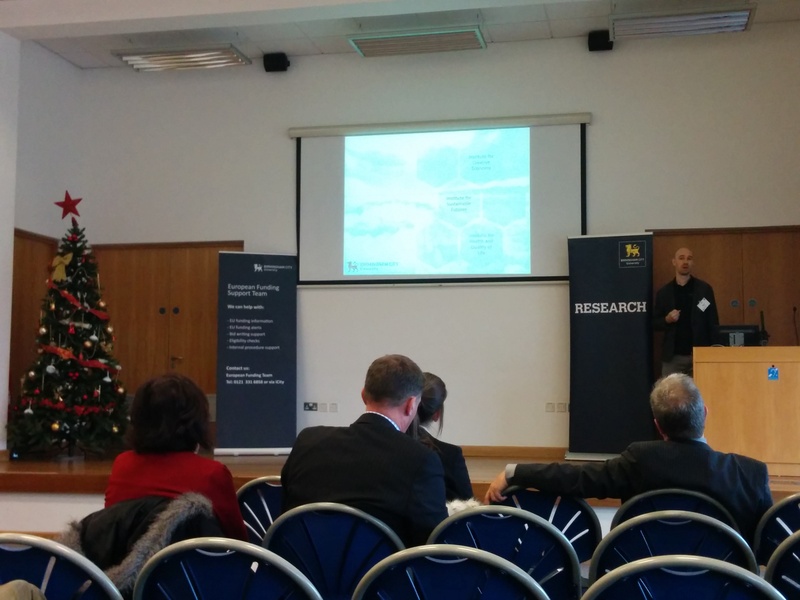 Next was ‘Delivering Change through Interdisciplinary Research’ by Mark Reed looking into how BCU, and as research individuals, we can reap rewards from this landscape. He coined “trans-disciplinary” after examining mono-disciplinary and multi-disciplinary research practice (making me and my PhD land of “transcultural” curating very happy)…we don’t produce knowledge for knowledge sake, it is for impact and the importance of this impact agenda. Mark mentions the theory of ‘Paradigm Shift’ as a way to create impact…not something I am familiar with so I have asked him for more information. Reflect and sustain – monitor and reflect on your knowledge and how you can take it farther and wider, beyond your research circles…sustain your work for longer. This concluding statement by Mark resonated deeply with me as this is how I negotiate my professional practice every, single, day…and what I try to instil in my students, my colleagues and those who surround me. I truly believe this is how many of the crazy things in my life have happened…through the simplicity of honesty and trust. Why blogs? Blogs are an interactive media, “interaction-at-one-remove” (Nardi et al. 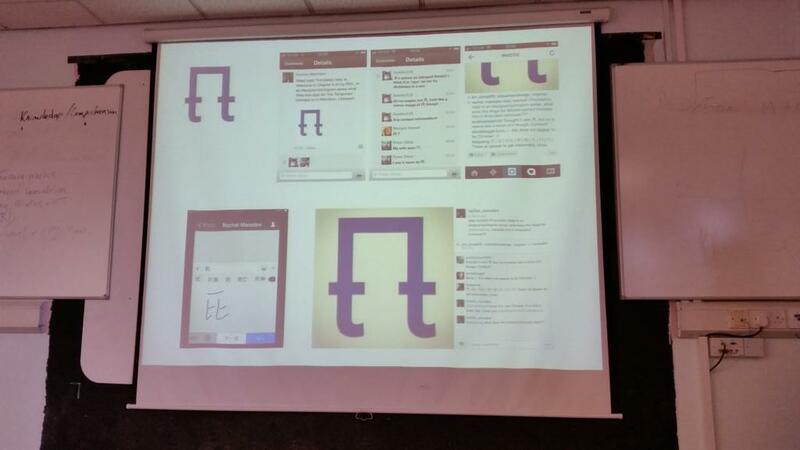 2004) asynchronus means of CMA, graphic and communicative immediacy, current language trends. Variation of labels and inventories…not restricted to singular words. Using a swear word might not equal swearing…used in a metalinguistic way. Context in use in vital in determining the meaning of the word and text…collocation analysis (co-location, two words appearing side by side…meaning determined by context of use)…they examined shared and unique collocates. Swears are often used in clusters….intensifiers “such”, “complete” and “total”…also collocate with “like”, quotative “I was like”. There is application of this in refining profanity filters. More information can be seen here www.webcorp.org.uk/blogs I recently came across this article on the history of swears/swearing – The first uses of the filthiest words in the English language – so I sent it onto them. 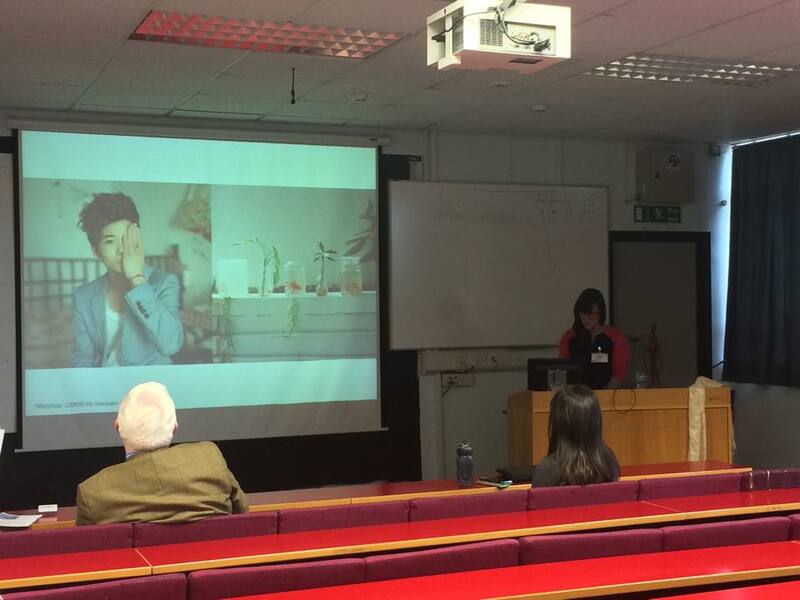 For my ten minute presentation, I spoke about ‘The Temporary: Curating China’s “Architecture of Change”‘…a topic that I am now very used to talking about as it has been over six months since the project happened. Still yet to post about it here on the blog. I introduced ‘The Temporary’ and the inaugural exhibition by citing statistics about China and Shanghai’s rapid urban growth, ghost cities such as Ordos left in the wake of rapid urbanisation, then leading into how this gave me a focus of transcultural experiences of “architectures of change”. 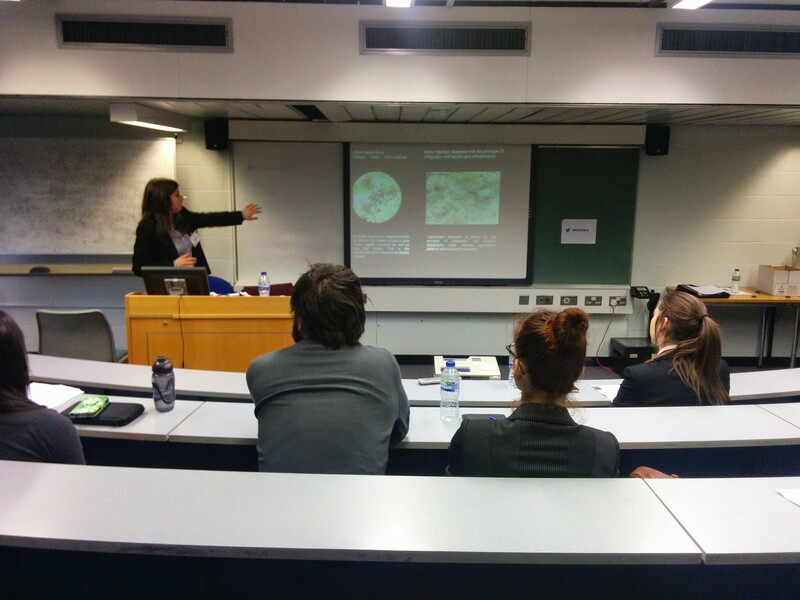 Christine Lloyd followed, talking of ‘Analytical Network Processing Methods in Bioenergy Research versus Life-Cycle Analysis Models’…where she noted the use of “Fuzzy Logic” as a methodology, implemented when there is a degree of uncertainty and for understanding complex systems. 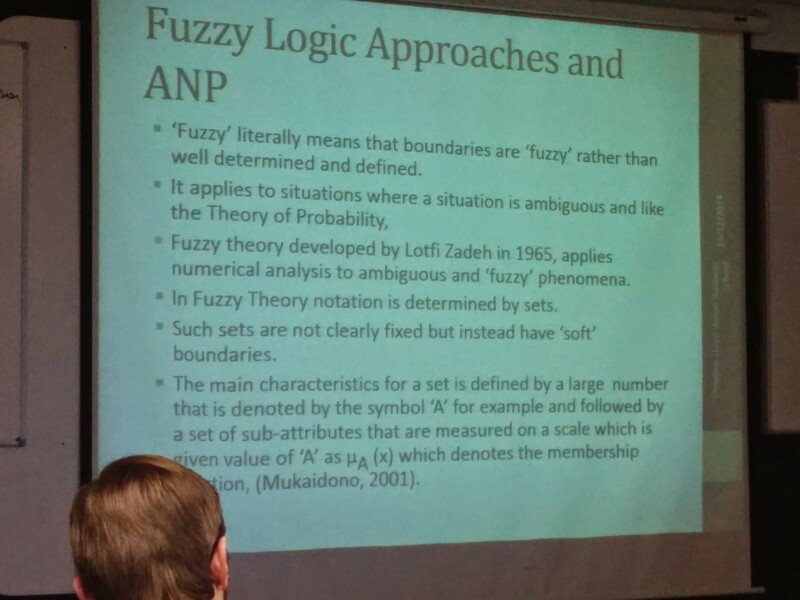 I’d never heard of “Fuzzy Logic” before so I had a little research as to what it was about…shown below. As the sessions in the lecture theatre where I was got shuffled around due to a non-attendee, I only managed to catch the end of Ed McKeown‘s presentation on ‘Why are there no music curators?’. I desperately wanted to see this presentation due to its resonance with my current work and the sound works produced as part of ‘The Temporary: 01’. He has just started his PhD research and runs the Third Ear. As I walked into the lecture theatre, he was talking about the denial of genre is in itself a genre convention…one field of practice is to make claims and contextualise them as what art might be, the other is to make just one claim. He went on to speak on the contentious issues between the terms ‘music’, ‘sound art’ and ‘sonic art’…music audience versus a contemporary arts audience…the potential of seeing different musics as different discourses and the relationship between theses discourses and practice…music as an aesthetic experience…the rituals and practices that are carried through, to experience and how these are taken on by the public. How we look at the relationship between subject and object, where listeners relate to music as an experience…moving away from the artistry of music being within music, but being produced socially. The social production of music is not just about creating homogeneous communities, it is about “otherness” (where this word is problematic in my research in terms of classifying cultures, but different here it is used as an aesthetic understanding). He also wants to look at material and anthropological systems…as previously mentioned, how genres construct discourses and how we talk about and identify the remainder or supplement that is not contained in the discourse…ultimately, it all relies on criticality and reflexivity. She wants to research the nature of social media use among creative and cultural workers, and to what extent it can inform the understanding of creative communities…through Twitter, community networks, strong and weak ties, social and other capitals, making reference to labour and precarity. 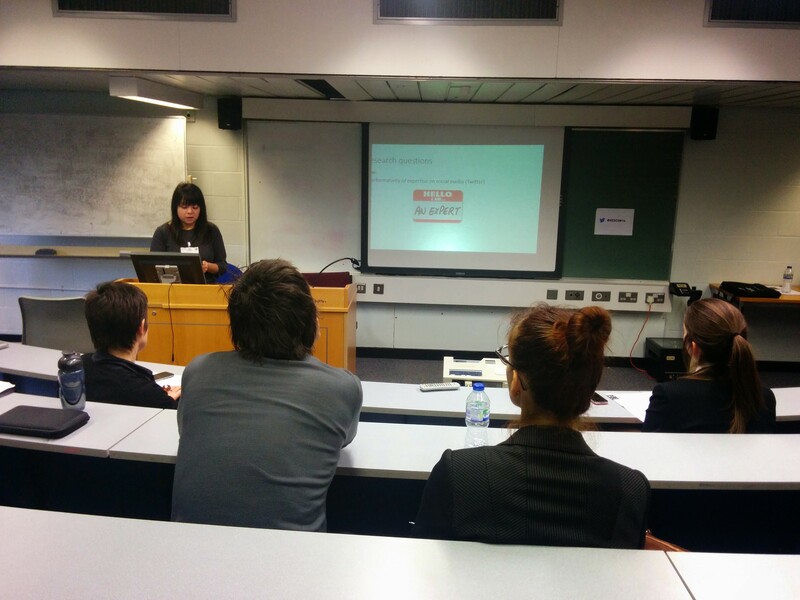 Karen cited the “performativity” of expertise on social media (Twitter). What is the nature of Twitter use in the everyday lives of creative and cultural workers? How is expertise performed on Twitter? What can both of these tell us about the workings of the creative economy? How do we think about zero/low-carbon in regional areas? What does sustainability/low-carbon look like in an urban form? What do expect (green spaces? Water?)? How would you deliver a new “Garden City” which is visionary, economic and viable? Through case studies she would look at low carbon’s representation in master-plans, open spaces, use of water, bisecting space, connections in and between space including transportation, water strategies, city extensions and “snowflakes”. There was a huge focus on words and terminologies in Anastasia’s work. How does this all fit with the topology of the lands? See the role of drawing into master-plans. A question from the audience, well more of a statement, asked are we locked into a geometric world too much? Should we be looking at the space of flows not a place of shapes? 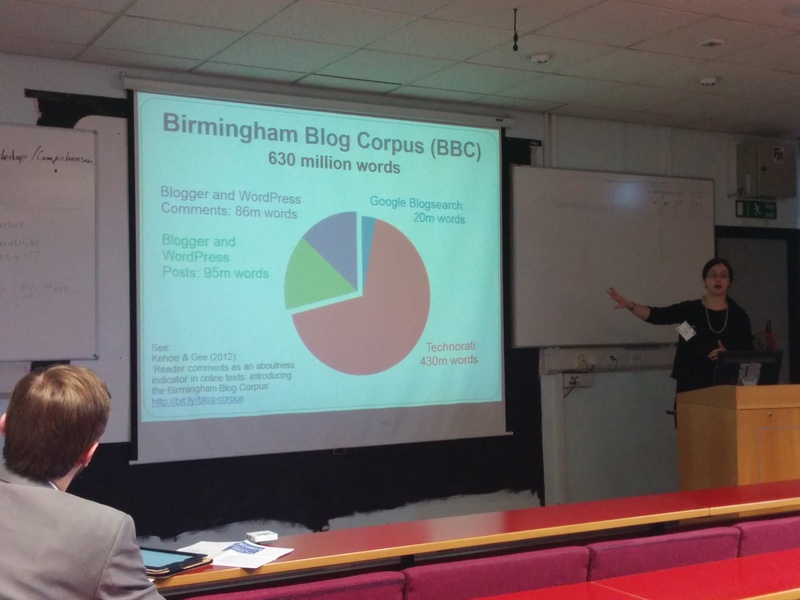 After this presentation, it was time for wordgirl to move on to write and type…so I missed the final part of the day (apologies to Sian as I really wanted to hear about your research!). Be a catalyst and not always a place of resolution(? ).